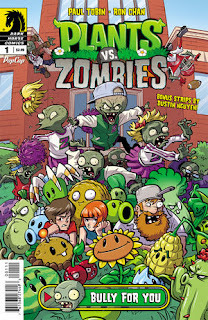 The Fellowship was fortunate enough to obtain a copy of PLANTS VS ZOMBIES: BULLY FOR YOU #1 from Dark Horse Comics. Paul Tobin writes, Ron Chan draws and Matthew J. Rainwater colors. Zomboss is a very busy zombie, running around town hatching another nefarious scheme for taking over. Nate, Patrice and their plant friends are on the case, though, patrolling the town and preparing for just such an occasion. But several mysterious phone calls have summoned a new group to the town – behold the Anti-Bully Squad! Zomboss’ attitude may finally have caught up to him this time. This book is based loosely on the popular game, and it (like the game) does a great job of making zombies available to everybody. The jokes are aimed at a pretty young audience, and there’s really no violence to speak of. And it’s still entertaining, with a cohesive story and some small surprises along the way. The art also works well for the younger crowd, and the bright colors add to the fun appearance of the book. Mainstream kid-friendly zombies, an eccentric cast of characters and a message against bullying. And bonus stories! This is a good book on a bunch of levels, so go check it out. PLANTS VS ZOMBIES: BULLY FOR YOU #1 is available now at your FLCS or at darkhorse.com.